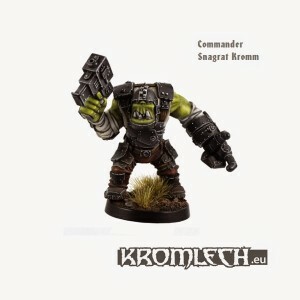 Talk Wargaming gives us their thoughts on the Orc SMG Squad from Kromlech in this new review article. Kromlech is one of the top 3rd party producers of everything orky, and for this little review we are taking a closer look at some armored brutes, which will work perfectly for truly 'ard boyz. The Armored Orc smg squad includes nine armored Orks armed with, surprise, a smg, and some heavy armor plates thrown randomly across their bodies in prefect Ork DIY fashion. The set contains enough heads and extra face plates, to assemble a varied squad, despite the fact, that the poses are pretty much given, with no great options to change the poses around. Like most, if not all, Kromlech products, they are cast in resin, so be sure to give them a good wash(the soap and water kind), before trying to glue them together. The sculpts are pretty clean, with few mold-lines in need of removal, which makes prepping them for painting a breeze.